I do love Oxford, not just for its beauty, and the fact you can go up many a twisty staircase in the Gothic towers, feeling frightened and exhilarated at the same time, but also for its central location to the verdant South of England. A short ride to the East I get to enjoy the sights, bright lights and garrulous music bars of London, where everything swings like a pendulum do..., and to the West, I typically have the rolling hills of the Welsh Borders, around the Wye valley, where, when my shoulders used to let me, I used to limber up for any climbing expeditions I was set on, by practicing scaling and rappelling the cliff gorges over the river. These days a visit there, as I did Monday, is a more sedate affair, especially when it involves a literary festival. 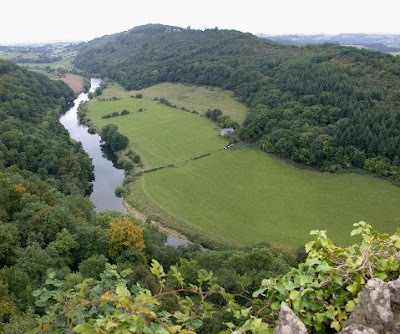 The tiny town of Hay-on-Wye in southeastern Wales, just inside the border, seems like a curious place to hold a major literary festival. For 10 days at the end of May, the town is given over to writers, and its population of 1,500 swells to a remarkable 80,000, as visitors troop to see the likes of Dave Eggers, Kazuo Ishiguro, Don DeLillo, John Updike, Clive James, Julian Barnes, Ali Smith, Patrick McGrath, Jeannette Winterson, Doris Lessing and Jaqueline Wilson, to name a few who have appeared recently. Not only can these writers engage in ordinary literary-festival activities — reading from their works, discussing their inspirations and answering the inevitable pen-or-pencil-preference question — but they can also be found wandering around town, ordering coffee in local cafes, getting drunk in the bars and buying books in the used-book stores for which Hay is renowned. 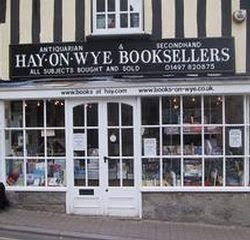 Hay has a remarkable 39 bookstores, working out at about 1 store to every 38 people. 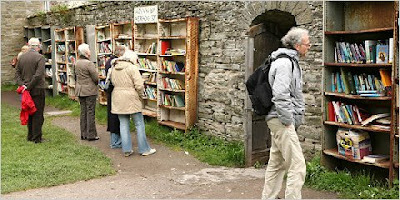 In the season there are even "honesty" selections inside the ruins of the castle walls, where you leave 50 pence if you find a book you want. That Hay has an absurdly high concentration of used-book stores is due in large part to the efforts of Richard Booth, a zealous used-book seller who opened his first shop in 1961 and has actively encouraged others to follow. There's one devoted to mysteries and thrillers, one to poetry, one to bee-related books, another to books about music, and another to rare children's books. There are huge ones, like the Hay Cinema Bookshop, and modest-size ones, like the delightfully named Sensible Bookshop. 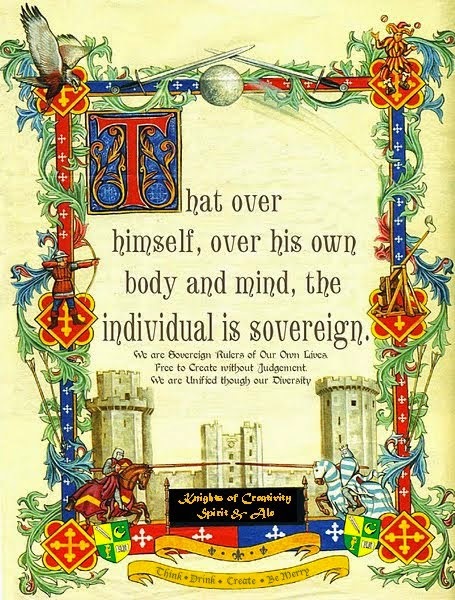 Trawling through one such shop, let alone a half-dozen, requires fortitude and flexibility of thinking, which of course is what a Knight of Moleskine, Spirit and Ale is all about. While I failed to locate the book I wanted : an early edition of "To the Lighthouse" by Virginia Woolf — I did procure "The Art Of Living" by Andre Maurois ( in French, which I now aim to doggedly translate ), a nice early "Wind in the Willows" by Kenneth Grahame, and a first edition "Clockwork Orange" by Antony Burgess.. 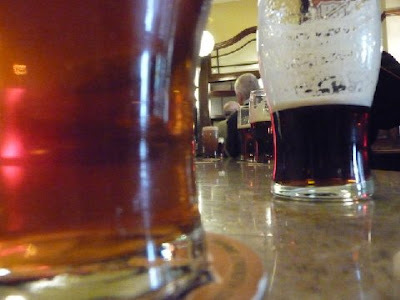 So a splendid way to spend a summer morning, followed by lunch in a town Inn of : a rich tomato-based fish soup, and moving along into a traditional Welsh lamb stew, helped down by a good local brew. .........and as I lay on the grass in the sunshine, I took from my knapsack, a further book I'd found in the castle grounds, by that arch -funster Arthur Schopenhauer, in which he says " the business of writers is not to chronicle great events, but to make small ones interesting". Quite so Artie. A most excellent post, Sir D! I love the phrase, "Woodstock of the Mind". Of course, ole' Bill didn't inhale when he thought of that one! Seeing the green of England is giving me the strong urge to fold up shop and head on over right now, instead of waiting til July. I love the old bookstores of England. The Hay Festival is being added on to my bucket list. 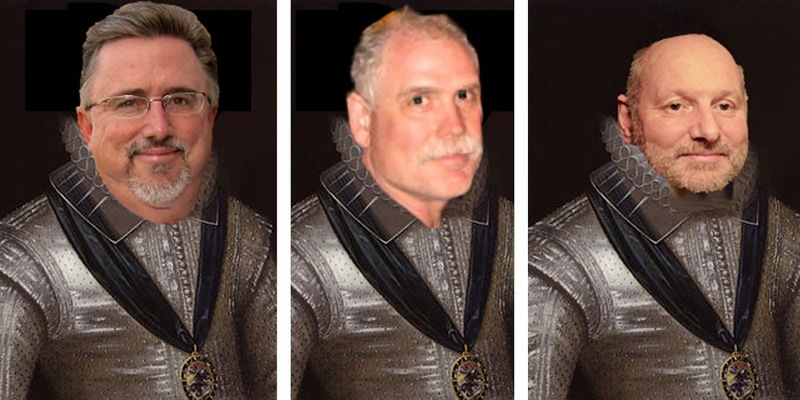 Ole'Artie must have been a closet Knight of Moleskine, Spirit and Ale...because all we do is take every day events and make them interesting! Like, how are you going to get that book out of your arse?! P.S. I noticed shorts on the green. What's this about not letting me bring mine? I do believe I see my version of Heaven on Earth! Sunshine, books, and good food and drink...throw in a sailboat on blue waters...and I'll move on over!! Very nice blog, Sir Dayvd. Now, where is the picture book section? Lady Suz.. Pop's is okay.. he is 89..and still a peppy old buzzard.. ( probably the biggest shock i got yesterday was that he was doing the cleaning.) My sister lives in France at the moment, and we are pretty used to getting phone calls saying he has had a mishap. The real doozy yesterday was the way a chemical incident sparked a full scale arrival of the emergency services...paramedics, fire crews and police.. Nice to know the system works. Naturally he is dining out on his tomfoolery...which he has now realized could have killed him. Glad to hear about your dad. I'm surprised that Fox News didn't do a story about an old Home Grown Terrorist brewing up Poison Gas in Oxford last night! You should go to an Army Surplus Store (at least that what they call them here) and purchase him a gas mask. LOL! By the way, I'm getting the old gamms ready for display on those warm July English days! yeah .. i'll be looking out for a gas mask as a joke extra present for Christmas. He is in good spirits about it...but boy that chlorine is lethal stuff.. WW1 in the trenches in belgium and France when the germans used it on the troops must have been hellish..
A mark of how lethal is that the offending bottle of Toilet Duck with its mix of bleach still in it, is under lock and key at the hospital awaiting the proper Chemical authoritories to come and dispose of it safely, in a manner that it will never be a problem again to the public. Yes we are scanning the local publications in case he gets a mention. We have chlorine tablets we have to put into the pool pump. It's in a vapor lock bucket, so I hold my breath whenever I open it and crab a couple of tablets to put in. My grandfather Baker was in the trenches in WW1. I only heard him talk about three things of his experience...1)gas attacks 2)crawling over a several days dead Italian in no man's land 3)crossing the trenches after the peace treaty was signed and celebrating with the Germans who were just as glad it was over.